Day 30 - No title yet. This started with lots of black mark making and a Green and Gold glaze over it. Black, White, Grey and Red were then added (multiple times with scraping). There was a lot more Grey which I painted over with White. I happy that I posted 30 paintings this month. I think I learned a lot! Thank you all for reading my blog postings and viewing my art. Comments have been wonderful, thank you for that as well! 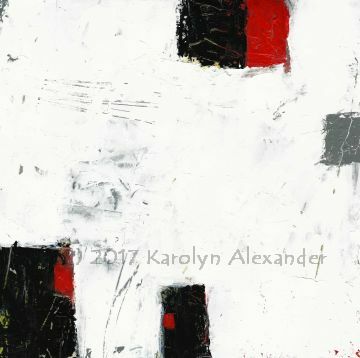 Great piece for Day 30, Karolyn—I see a mostly "blank" canvas shaking its finger at me with a smile, saying, "Just because you made it to day 30 doesn't mean you've 'finished.' Hubba, hubba! Keep that brush active! Here's a door, and another, and a couple of windows. Open 'em up!" Thanks, Karolyn, for the gift of your paintings and camaraderie this month! Hi Dotty! You know to be honest, I am not really comfortable with all that white and the all the shapes along the outer edge. I wish there was more of the under painting mark making visible. Perhaps it just needs a line; but then, where? I will put it away for a few days and then take a fresh look. Thank you for all your comments during the month. The delightful to read and contemplate.